You’re likely going to think I’m insane with the number of cookie cutter posts I’m about to make — and by that, I mean posts about vintage cookie cutters, not posts that are all the same lol. Only another collector of cookie cutters could understand the need to make so many posts about cookie cutters! I began with the vintage aluminum self-handled cookie cutters in that “tin” color, but quickly ended up with the vintage copper colored aluminum cookie cutters too. Since I began my collecting in Wisconsin where many aluminum manufacturing companies (Mirro, Standard Aluminum Co., etc.) were located, it’s been very easy to get my cookie cutters. Most of the ones shown here are circa 1940s; though many of these cookie cutter designs have been made for decades. 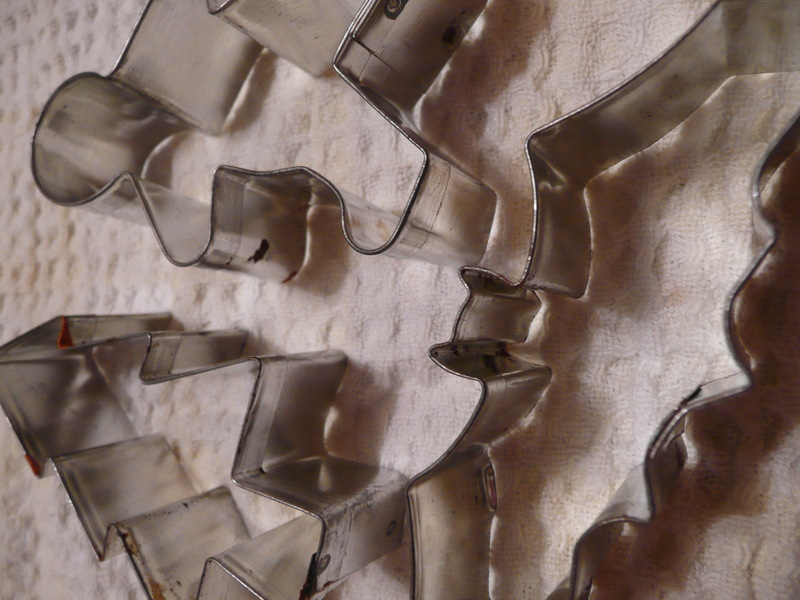 Though for all my vintage aluminum cookie cutter collecting, I do not have as many complete sets as I would like. Even with the common sets. For example, the set of four suits or “bridge set” still eludes me. Everyone saved that heart for Valentine’s Day; but few seemed to have saved the club, spade, and diamond as well. But “not having yet” is simply the fun that keeps collectors hunting for more. So I can’t say I’m at all disappointed to keep looking! 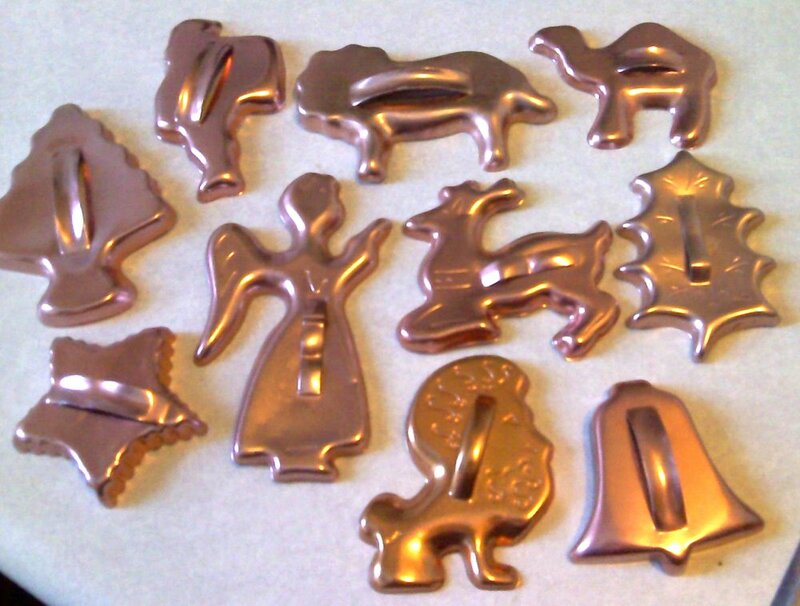 So now, the question is, Laura, which one of these vintage gingerbread cookie cutters is like the one you remember? 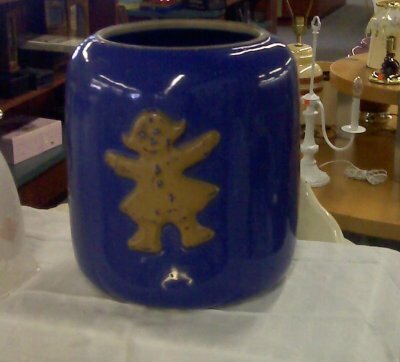 Can You Catch The Vintage Gingerbread Man Cookie Jar? I sure had second thoughts when I saw that the back of this vintage pottery cookie jar had Mrs. Gingerbread Cookie. 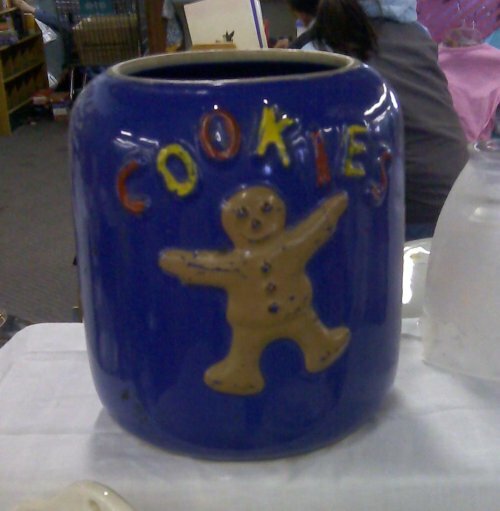 If this cookie jar interests you, contact me and I’ll see if I can catch him — even if he is The Gingerbread Man. Posted on January 17, 2010 January 17, 2010 Author DeannaCategories KitchenaliaTags cookie jars, gingerbread, pottery, thrift store finds, vintage8 Comments on Can You Catch The Vintage Gingerbread Man Cookie Jar? I used to have cookie cutters that belonged to my Grandmother. I remember a gingerbread man. It was aluminum, a dull silver colour. The shape was filled in, not like the modern ones that are open on top. The old gingerbread man was wearing a pointy hat. That’s about all I can really, clearly remember about him any more. It’s been a long time since I’ve seen that cookie cutter. Too much moving, too many boxes lost or damaged. Lost due to things like the water heater bursting and flooding the basement. Mice nibbling at boxes which were then thrown out as useless. Or, boxes just being forgotten in some corner of one basement or another. It’s sad to lose things that way. It bothers me more than any other way of losing things. As if the things lost that way were never important enough to remember. But, I have the hope that my lost things will be found someday and become someone’s great find, treasured all over again, though they won’t know the history. They won’t know that cookie cutter once belonged to my Grandmother. They won’t know my Grandmother, my Mother, my brother and sisters and I made gingerbread people many times with that old cookie cutter in the kitchen of the house I remember best from my growing up days. I wish I could tell whoever finds that cookie cutter the history behind it. Tell them about how my Grandmother was once nicknamed Pepper and how she liked to plant potatoes in the garden to aggravate my Grandfather. I’d like to tell them about how she fought breast cancer for years until she had to show/ teach us all how to die quietly, with pride and courage. I miss her. I really wish we had that cookie cutter still. There is some hope it will turn up in a box not opened during years of moving from place to place. More likely it is gone, to be found by someone who will wonder about that cookie cutter and other things that may be in the box they find in some corner of the basement of the house they move into. It would be nice to tell them about that cookie cutter. To let them know it’s not just another old cookie cutter. But, it doesn’t work that way with lost treasures. The story becomes a secret known only to those who lost it. Those who find it can only wonder or imagine what the history behind it might be. Maybe, when they imagine the story they will get some of it right. That would be nice. I have other new cookie cutters. A small collection of them. This Christmas I tried making gingerbread men again. I made the batter from a recipe online. But, when I tried to cut out the cookies the batter was too runny and sticky. It could not hold the shape. So no gingerbread men again this year. I will find a better recipe next year. Ideally, I’d like to get matching cookie cutters for gingerbread men and women and another for a gingerbread house cookie shape. Those would be the pinnacle of my collection. 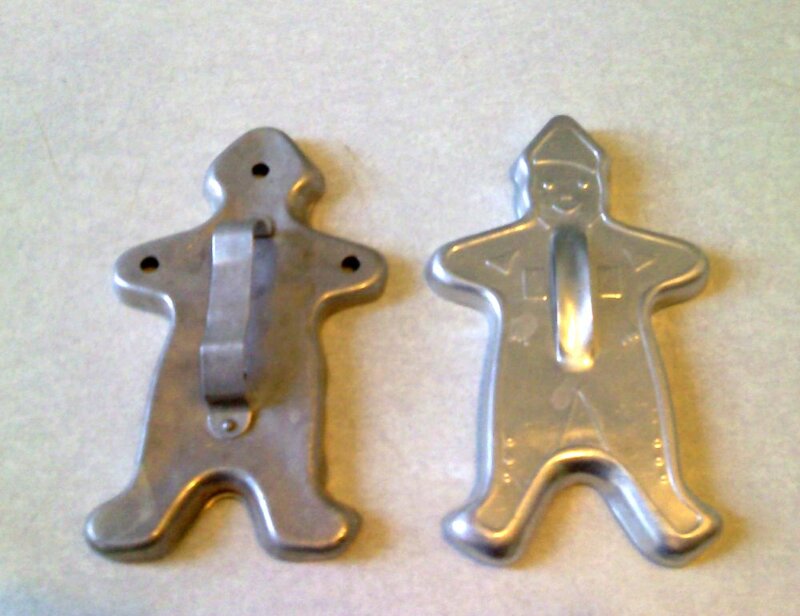 Note: The aluminum gingerbread man in this article, from HubPages: Collecting Vintage Cookie Cutters, looks like my Grandmother’s old one. It might be the very same kind that she had. Also, we had a Christmas tree and that bunny from this collection too. Ours was badly dented in the middle though. The Cookie Cutter Collector’s Club – Based in the US. The 2010 convention will be in California, in June. Cookie Cutter Search – From the Cookie Cutter Collector’s Club. There are cookie cutter collectors displaying their cookie cutters in photos on Flickr: Cookie Cutters. After you look at that group, see how the cookies were decorated on Flickr: Cookie Cutter Cookies. 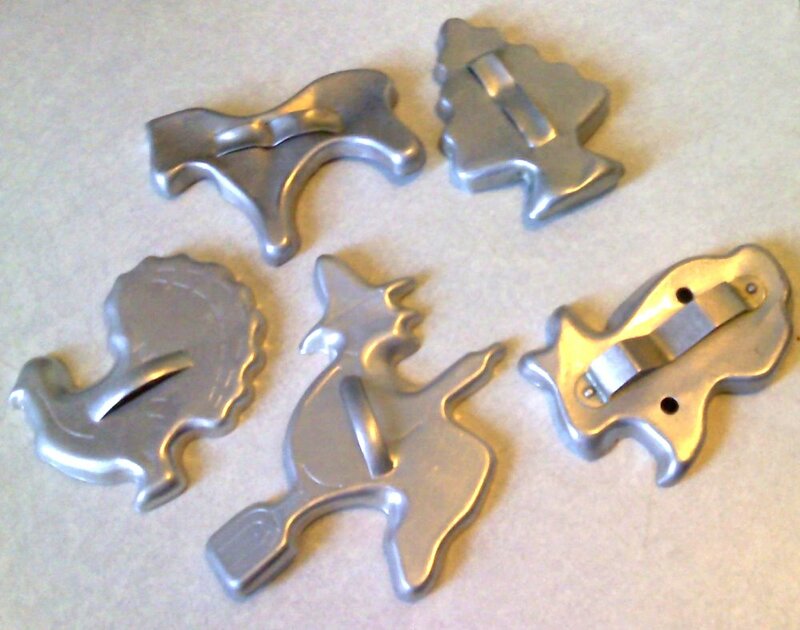 Brand Name Cooking – Has posted a good article about collecting cookie cutters.